According to trusted Robert Anton Wilson scholars (see "Robert Anton Wilson's personal tech ecosystem"), he used to post on Usenet using the pseudonym "Mark Chan". Shared in commemoration of Robert Anton Wilson Day, here is a list of links pointing to the various newsgroups he posted to. The linked pages contain direct links to his posts (sorted by year and month). Due to Google Groups having a less than ideal search interface (which seems to change every few years), there may be additional unlisted groups where RAW posted. If you happen to find more, please let me know in the comments section. I hope you enjoy reading RAW's unfiltered and unedited Usenet posts as much I did*. He must have had a certain amount of trickster-ish fun posting under an assumed name, especially in discussion threads about his own work. His four primary haunts are listed in bold. * At the time of this writing, I haven't read every post. The views contained therein do not necessarily reflect the views of the author (me) ... but you never know. I used 2016 since it's a full year's worth of recent data. I excluded conventions that were postponed or canceled. Washington DC, while not a state, is included on these lists. California and Florida are the clear winners. Near the bottom of the list, you'll find several states with only 1 convention in 2016, but Wyoming isn't even on the list, the only state without an anime convention in 2016. California and Florida are not huge surprises, since they are #1 and #3 in the US in terms of population; you'd expect a lot of events in those states. 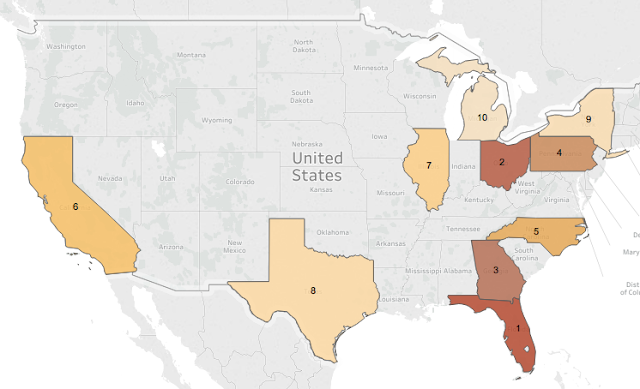 So, what happens we look at each state, ranked by anime cons per capita? The picture changes quite a bit, with South and North Dakota jumping to the top of the list, followed by Tennessee and Maine. Florida is still up there, but California with its much larger population lags significantly. What if we look for states with the most conventions per square mile? Washington DC (not a state, but close enough) is at #1 followed by New Jersey, Rhode Island, and Maryland. Florida manages to stay pretty high at #5. 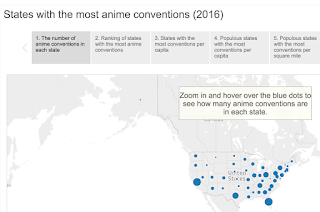 This is all well and good, but the rankings presented thus far don't really answer one of our primary questions: Which states have the most conventions serving the largest number of anime fans? In that case, it doesn't make sense to overemphasize anime cons per capita or anime cons per square mile in states which have very few people in it. We want to find out where there are a lot of cons serving a high volume of people. So, let's look at the same data above, but filter the lists by population. When you look at the states with the most anime cons, they are also the states with the most people, with two exceptions: Tennessee had 15 cons, but only 6.65 million people, compared to New York which had 14 cons and 19.7 million people. Michigan has 9.9 million people, but only had 6 anime cons in 2016. Now, Florida is #1 and Ohio is #2. California and Texas, with 36 and 23 cons in 2016 respectively, are not in the top 5 due to their high populations. 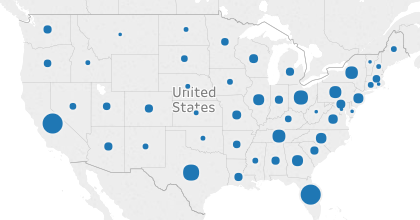 Florida cons are more spread out than Ohio cons, so there are more events in Florida with overlapping dates. 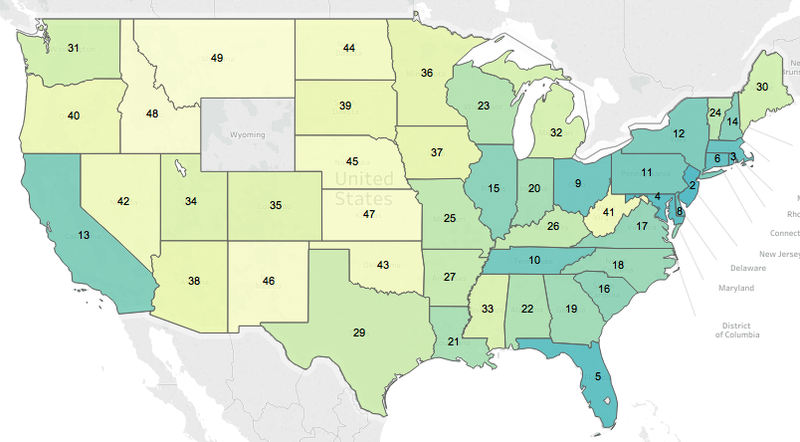 When we only count events with unique dates (assuming no one is likely to attend two conventions in the same day), Ohio actually edges out Florida in this metric (anime cons per capita). Florida and Ohio come out on top again! Secondly, we obviously need to talk about Florida and Ohio. That there are a lot of conventions in Florida is perhaps less surprising, given that Florida is the #2 tourist destination in the US after California. Ohio, on the other hand, is #12 on that list. Note: It's not just anime conventions. The same people who made AnimeCons.com also made FanCons.com . Using fan convention data in general, I created some visualizations to examine that. Based on the same type of analysis, Florida and Ohio come out on top there as well (across multiple flavors of fandom, not just anime). 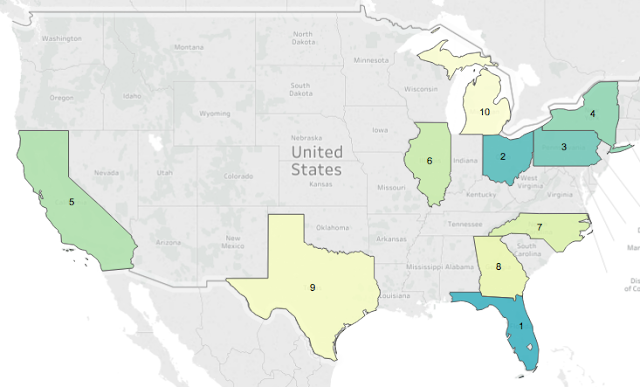 To date, I've been to 51 cons in 5 states (California, Maryland, Ohio, Georgia, and New York), but mostly in California where I live, and mostly repeat visits to the same few conventions. I've had the honor of being a repeat guest at Anime Punch: Armageddicon in Columbus, Ohio. I remember a staffer I spoke to telling me about all the conventions she went to in Ohio, either as an attendee or as con staff. It was hard to believe there were so many, but the data doesn't lie. I've never been to Florida, but I am acquainted with the folks from the Anime World Order podcast who are from there. I'll leave it to them (and others) to tell us about the particulars of anime fandom in that state. I do know that both states have old school anime cred, Florida being the birthplace of JACO - the Japanese Animation Club of Orlando - home of JACOsub, one of the earliest pieces of fansubbing software. Ohio is home to the venerable OSU anime club, formerly known as "Animate". 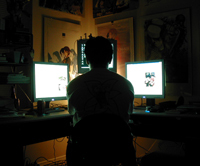 Ohio State servers were the original home of the Anime Web Turnpike. Going back even further, it's where the Venice FTP anime-manga archive was first hosted. I've been to Ohio for Anime Punch 7 times, not enough to really get to know Ohio fans, but the scene there was unique and I really enjoyed it. It gave me a much stronger appreciation for small cons. I've been to Anime Expo, Otakon, and San Diego Comic-Con plenty of times, and they're great, but the energy and enthusiasm of a lot of small cons out there is something to be experienced, and Ohio has plenty of them. You might say: some people attend a few big cons as special events; others attend a lot of smaller cons as a lifestyle. 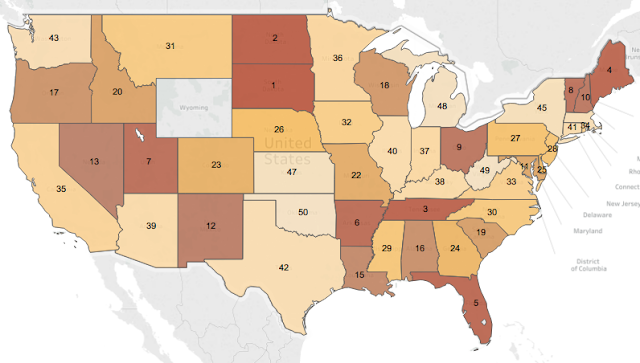 Ohio has been called the nerdiest state (a badge of honor, in my opinion): people in Ohio apparently visit libraries more often than people in other states. Maybe there's a connection between reading/library-going and anime fandom, but that's another study for another day. I have fond memories of con-going in Ohio. Someone invite me to Florida so I can get a measure of fandom in the Sunshine State! I'm glad to see it's starting to get the attention it deserves (see here and here), because The Lost Arcade (2015) is the best subculture documentary I've seen in a long time, and I've seen plenty (and even helped on one). 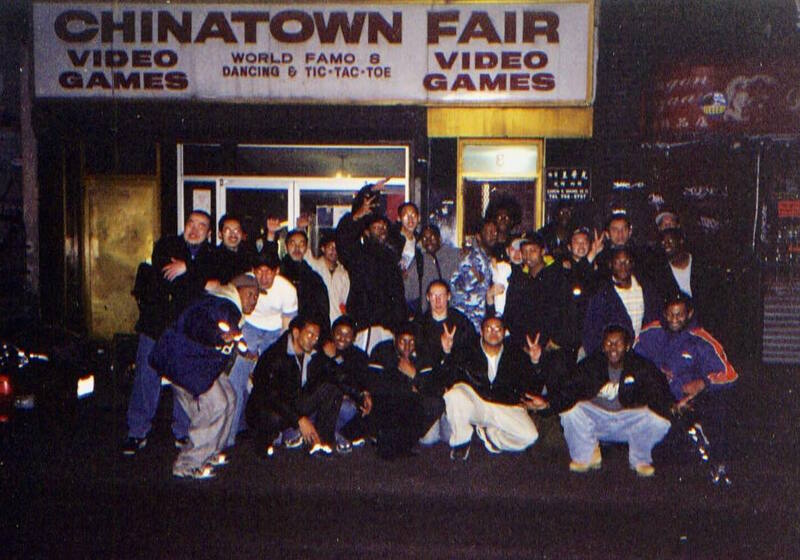 It's the story of Chinatown Fair, the historic penny arcade turned video arcade in NYC Chinatown, how it closed down and then reopened (in quite a different form), and the community of people for whom it was a second home. 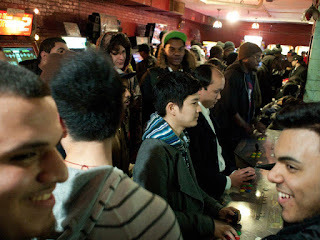 The documentary's singular and intimate focus on one arcade, its historical significance, and (most importantly) the people who inhabited it, has so much to say about so much more than its title would suggest, but it does so in an understated way. Its tone is less instructive, and more reflective. Instead of being explicitly analytical, it's more atmospheric and empathetic. The Lost Arcade paints a portrait of one very specific microcosm--primarily the players of one genre of video games in one arcade in New York City at one particular point in time. But this narrative resonates far beyond that time and space. It is a story that has played out the same way in other locales and in other circumstances, so that many of us, who have never visited Chinatown Fair but belong(ed) to our own transformed communities, know exactly what the documentary is talking about. Years from now, dismissive critics might naively point to how dated the film is, how gaming and arcades and neighborhoods and cities have moved on, but they will have missed the point. Filmmakers Kurt Vincent and Irene Chin have documented something that will inform and inspire us for years to come. That's because it's more than a movie about a genre of video games, or video games in general, or one or even a thousand video arcades, or one particular subculture/community, or one particular neighborhood in one particular city. It's about all those things, and more. It's about subcultures in general: how they change, for good or ill, whether by choice or because of forces they can't control, and the consequences of those changes. The film shows us how home video game consoles and the Internet forever changed the way video game players interact with each other. It's also about what's happening in cities and neighborhoods across the country, about the devastating effects of gentrification--altering the urban landscape, and the displacement of local culture for the sake of profit. Most of all, it's about the communities we build, the places we inhabit not because we have to be there, but because we want to be there. 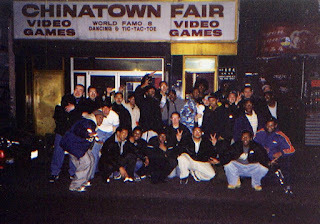 It's about Sam Palmer (the owner of Chinatown Fair) creating a vibrant space for people from all walks of life to interact, initially gathered by a shared interest in video gaming, and ultimately staying because they grew attached to the people they met there. It's a celebration of those kinds of communities--the fact that they exist, the fact that we can create and be part of them. But the film is most poignant as a story of loss. Although Chinatown Fair was the last of its kind in Manhattan, the documentary is called The 'Lost' Arcade, not the 'Last' arcade. For the players at Chinatown Fair, they really did lose their community. It was taken away and transformed (brutally, some would say). I watched the film in April when it played as part of the San Diego Asian Film Festival Spring Showcase. I still get choked up when I recall the scene featuring Akuma Hokura, one of Chinatown Fair's most important denizens, visiting the new incarnation of the arcade. The scene featuring arcade manager Henry Cen--struggling to come to terms with the way his vision for the arcade had been perverted--also hit me pretty hard. Among those of us who belong(ed) to subcultures that have changed, some of us have felt that same sense of loss. It's a familiar story: we were part of something good, and while some things have changed for the better, we've also lost some important things along the way. More so than video gaming, the subculture/community I belonged to in the 90s and early 00s was anime fandom. I used to (but no longer) dream about anime conventions the way the opening narrator of The Lost Arcade dreamt about Chinatown Fair. We (the anime fan community in those years) were part of something special that only existed in that particular form for a relatively brief moment in time, and it might never come back. Don't get me wrong. It’s more than just bittersweet nostalgia or a knee jerk reaction to change. Things do evolve and improve, and change is not always bad, but the documentary shows us what happened to a community for whom change came knocking, not from their own efforts and desires, but from outside forces who didn't understand or care about them. Instead of just memorializing them, however, The Lost Arcade shows that community's beautiful and hopeful response. In the end, The Lost Arcade is a story of redemption in progress, a reminder that community is not just where we happen to find it; it is wherever we decide to build it. We can nurture and grow it when given the opportunity. It is a warning not to take those opportunities for granted. We have to seize them. We have so much to gain if we do, and so much to lose if we don't. We owe it to ourselves to make it more than just a dream. I earned my PhD studying anime fandom in America. In my professional life, I build and nurture online communities for companies and their customers. I am not much of a video gamer, but grew up going to arcades in Southern California and South Korea in the 80s and 90s. I've never been to Chinatown Fair, but my dad went there as a kid after moving from China to NYC in the late 1940s. I started this post with the simple intent to share/comment on the two videos below. I ended up writing an(other) essay on Gainax. Oops! Click the videos to view. Scroll down if you want to read. For over two decades now, fans have been talking about, picking apart, and generally obsessing over Neon Genesis Evangelion. I am no expert on that particular show/franchise. I look to otaku like Eva Monkey ( http://www.evamonkey.com ) and the good folks at Eva Geeks ( http://www.evageeks.org ) to keep me informed and educated on the vast world of Evangelion fandom and lore. I am, however, very interested and decently aware of things related to old-school, pre-Evangelion Gainax. Over the years, I've had the opportunity to see, meet, and in rare cases interview a number of Gainax staff and collaborators, including but not limited to Toshio Okada, Hiroyuki Yamaga, Takami Akai, Yasuhiro Takeda, Yoshiyuki Sadamoto, Kazuya Tsurumaki, Hiroki Sato, and Toren Smith. In 1996, I got to see Hideaki Anno speak on two panels at Anime Expo--a general panel about his own work, and an Evangelion-only panel. Anno, and all the folks mentioned above - they are otaku through and through. They were part of the first otaku generation and helped define the otaku ethic for the rest of us, not just via self-referential shows like Otaku no Video, but in everything they produced. The way they see the world, especially visual media, and reflect it back us in their own work resonates with otaku of all stripes. The Gainax creative sensibility might be described as postmodern*. Focusing on their earlier work, it is heavily and unapologetically referential, not as a cheap way to cash in on the goodwill of fans (of the works being referenced), but simply because the act of referencing was part of their creators' toolbox. Those creators, as fans themselves, liked what they saw and wanted to incorporate it, but differently and hopefully better, with a certain mix of reverence, nostalgia, and parody. For the most part, the references they used are "hard", not really intended to be understood by the majority of the audience. "Too bad", Anno might say. That's because they are there to help tell the story, not because fans begged for (or creators promised any) fun "easter eggs". You don't need to be a fan of everything Anno, Okada, et al. enjoyed to be entertained by their works. But if there's any overlap, or you simply like looking for references, it does add an extra dimension to the enjoyment and appreciation. The stories work at the surface level, but they also offer a lot to those who like to dig (e.g. upon repeat viewings). Here's an analogy to illustrate the point further. You don't need to be a fan of Flash Gordon or The Hidden Fortress to enjoy Star Wars, but it would probably change your experience of it. On the other hand, based on how they were written, the prequel trilogy almost requires a person to have seen Eps. 4 - 6. One day, someone (perhaps Anno himself) will catalog all the things that influenced his work. For now, we can only find scattered clues and guess if they are relevant. I will offer up a few random observations, obviously conjecture and potentially flat-out wrong, but hey...it's fun! My friend Sean at Zimmerit already covered Hiroyuki Yamaga's music video for Fence of Defense - Data No.6. It does include things that look like precursors to some visuals in Evangelion. Nadia too, for that matter! But I'm surprised not to have seen much talk about the intro of Gerry Anderson's Space: 1999, referenced in both Evangelion and Otaku no Video. Anno's Gerry Anderson fandom is well-documented. A film Eva fans might want to check out is Colossus: The Forbin Project (1970). An Evangelion fan noticed a scene in which the audio played backwards comes from the final scene of that film. Clever censoring of this sort is not unique to Eva and Colossus: The Forbin Project (see http://tvtropes.org/pmwiki/pmwiki.php/Main/SceneryCensor?from=Main.PeekABoo ), but let's be serious. Anno did not rip off Austin Powers; he is far more likely to have seen and been influenced by Colossus: The Forbin Project (or not). We could go on and on. I've been sitting on an Evangelion/Nadia/Illuminatus analysis for years. Who knows if I'll ever write that up! In the meantime, perhaps we should all check out Anno's latest work: Godzilla Resurgence (2016). * My favorite film director, Sergio Leone, was dubbed by Jean Baudrillard as the first postmodernist film director. Leone, a fan of American westerns, transformed the genre by using the elements of Western mythology in new and subversive ways. On a side note, Anno himself proclaimed his love of westerns at AX96 and bragged that he probably knew more about them than anyone in the room. Perhaps one could argue that Macross was the first major postmodern anime; it wasn't created by Gainax, but it was creatively spearheaded by two of their own generation - Shoji Kawamori and Haruhiko Mikimoto - and Anno, Yamaga, and Akai got their professional start working on it.